Once we already know the cues used by our brain to notice depth, it’s time to a little more technical chat. We’ll see a quick overview about some techniques used to acquire and view stereoscopic images to finally get the hands dirty for creating our own stereoscopic image in a simple tutorial for creating the stereo pair of pictures. A stereo image pair consists of two pictures that each one represents the point of view of an eye. These pictures are often very similar but not identical, thanks to the distance between our eyes. And the depth illusion comes as the brain fuses the two pictures in a single one. There is no secret in acquiring this pictures and taking them is not a hard process, once you don’t need anything fancy. With a simple digital camera you are able to create the depth illusion with them. Despite this easiness, using a regular camera will limits you to statical scenes with no move between the two shots. To extend the possibilities there are stereo cameras in the market that basically have two spaced lens for taking the stereo pair simultaneously. The tutorial that will be presented in next sections uses a regular digital camera to take two pictures of a motionless scene and simulate the depth. Once you already got the stereoscopic image, there are many techniques of viewing stereoscopic images, from free viewing to glasses free displays. The advantages and disadvantages are not the focus of this post, so they will not be explicitly presented here. Anaglyph – In this technique the pictures from stereo pair are made up of two color layers, superimposed and offset to each other. The final image contains these filtered colored pictures, one for each eye. With an anaglyph glasses with the same color configuration the stereoscopic image is revealed with the illusion of a three dimensional scene. 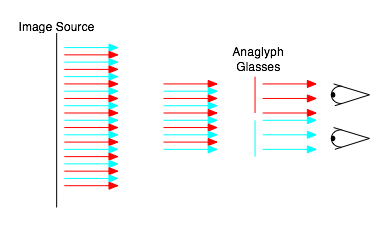 Anaglyph glasses uses color filters to allow only the passage of the correct image. Polarization – Instead of applying color filters in the pictures from the stereo pair, polarization reder each one with a different orientation. With the correct orientation of the filters in the glasses, only the respective picture will pass to the eye, and the visual cortex of the brain will take care in fusing the image with the depth illusion. 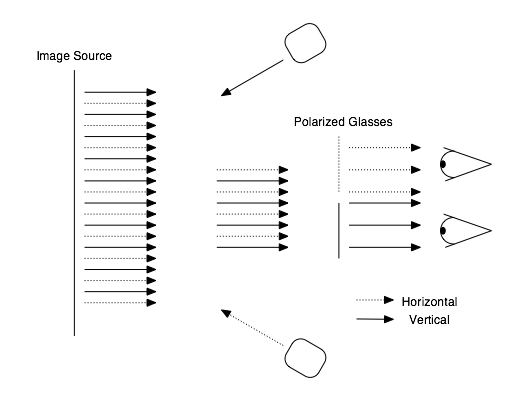 Polarization uses two projectors differently oriented to transmit the images and only the correct image will pass in glasses'eye. 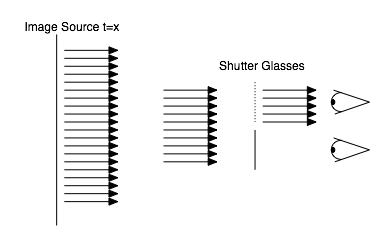 Shutter glasses – These glasses works only in sync with the transmissor of the pictures. Composed by two lens with a liquid crystal layer which are transparent when no voltage is applied. When the transmissor send the picture that has to be seen by viewer’s left eye, the glass’ right eye becomes dark, so each viewer’s eye only see the correct picture for creating the 3D illusion. Lenticular Lens – This technique consists in putting an array of small lens in front of an image source, each lens covers two pixels where each one are destined to an eye, these lens are responsible for redirecting the image to the correct eye. Lenticular lens adds a layer of small lens in front of the image source to correctly direct the image to the viewer's eyes. Parallax Barrier – Also consists in adding a device in front of an image source, this device consists of a layer with a series of precision slits, allowing each eye to see a different set of pixels creating a sense of depth through parallax. Parallax barrier adds a layer with a series of precision slits, for create a sense of depth through parallax. 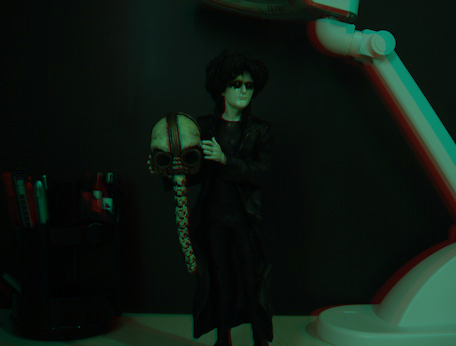 To create the stereoscopic image I used a regular point-and-shoot digital camera, a portable tripod and the already known my Neil Gaiman’s Sandman action figure. There are some hints to use when creating the scene to be photographed as remember the depth cues that you can reproduce with the pictures (e.g. parallax, occlusion and shadding) and trying to smooth as much as you can the movement caused by the offset of pictures. Usually this offset between human eyes is about 2,5 inches and this is the offset I used for taking the stereo pair. For representing the stereoscopic pair here in the blog I have just a few options, and I chosen two simple techniques. In the first one I used the pair for creating an animated GIF with a delay of 100ms and in the other example I used an image manipulation tool for making an anaglyph picture only useful if some of you have an old color filtered glasses in your house. All this process presented in this tutorial is simple and straight forward, there are many web services for creating animated GIFs and in a first page search you can find the tutorials for the anaglyph image. I hope all you enjoyed these two posts about the human depth perception and the ways we can represent them in two-dimensional displays.